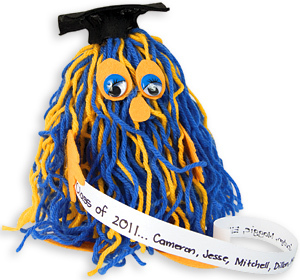 Get ready for the end of the year celebrations with this easy to make Mop Top Graduation Mascot. Display the mascot in the classroom as the year draws to an end, allowing those students who are graduating to reflect on the happy memories at Primary School. Wind a ball of wool of one colour, around a Mountboard Tag and repeat with a second colour. These might be the school colours. When the Tag is completely covered in colour, thread a short length of wool through one end and tie it in a knot to secure the ends together. Cut through the opposite end of threads to remove the tag. Glue the gathered wool on top of a painted Cardboard Cone. Cut feet and hands from Stiffened Felt and glue onto the Mop Top. Add Joggle Eyes and a nose. Make a Graduation cap, a mortarboard from Felt and glue it to the top. On a long strip of paper write the names of your classmates and glue this to one hand.